This stewed apple recipe is part of a series of posts that are focussed on specific foods which have been scientifically shown to improve the health of our guts and reduce intestinal inflammation. 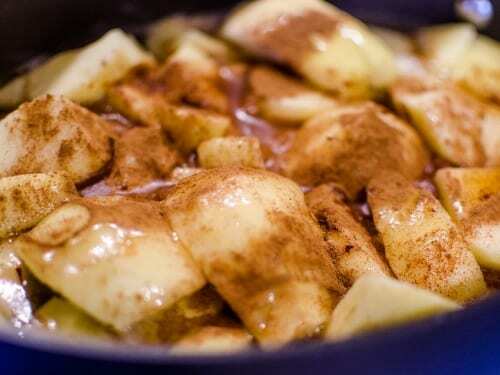 Stewed apples can be eaten as dessert, a snack, or a meal substitute (no more than on substitution per day), and can be cooked in the evening and stored in the fridge to be eaten the next day. Cinnamon can be added as it is anti-inflammatory and helps balance blood sugar spike that is seen after eating apples. Peel the apples if desired. The peel contains fibre, minerals, and other nutrients so it's best nutritionally not to peel. Core the apples and chop them into small evenly sized pieces. Cook until soft with rough shapes, no longer identifiable as apple slices. The colour should be a russet brown with the cinnamon effect. Add any desired Optional Extras once the apples have been taken off the heat (so as not to damage active enzymes /probiotics). Eat warm or cold. Delicious with yoghurt. The nutrients (polyphenols) in apples protect the tissues of the gut by reducing inflammation and helping the immune system to handle perceived threats, and increasing immune system tolerance to things that it should not react to. Clinical Education have an excellent pdf which goes into the science as to how stewed apples provide these benefits. Soluble fibre, such as derived from stewed apples, is resistant to digestion (it’s a prebiotic) and passes through the small intestine and is eaten by bacteria in the colon. The quantity of the beneficial Bifidobacteria and Lactobacillus bacterial species in the gut has been shown to increase when 2 apples a day are eaten. This is great as these bacteria produce short-chain fatty acids (SCFAs). Butyrate is an important type of SCFA that has been shown to regulate intestinal permeability (leaky gut) (1) and acts as a fuel for the cells that line the gut. It can also affect the expression of a large number of genes and affect many pathways within the body. Butyrate may protect the brain and enhance plasticity for example (2). Hummus Recipe What is Functional Medicine anyway?